Don’t we all have moments like that? 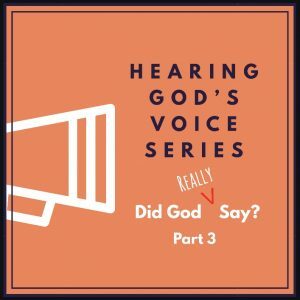 We think we heard God say something, but then we begin to question it, and pretty soon the fire of what He said is quenched by a wet blanket of doubt. We all know the story in Genesis where Satan baited Eve to question what God said to her, right? “Did God (Elohim) really say?” (Genesis 3:1). But before Satan could even begin to talk with Eve about what God said, he subtly asserted his idea of who God was — an uninvolved rule-maker! Satan did this by referring to God as “Elohim. Elohim is the name given to God in Genesis 1-2:3 when describing the general account of creation. Elohim is the impersonal, transcendent and general name of God. He created the heavens and the earth and everything in it. He is self-sustaining in need of nothing and far above His creation. It wasn’t until the Bible described in detail the creation of Adam and Eve (Genesis 2:4) that we are introduced to God as “Yahweh-Elohim.” Yahweh is God’s personal name and is used when describing His relationship with His people. He is a COVENANT-MAKING GOD! And because He is faithful even when we are faithless, this covenant starts with and is carried on by HIm! If Satan could undermine WHO God was and His relationship with Eve, he could then get her to question WHAT He said and His motives for saying it. Rules without relationship will always breed rebellion! Trusting and obeying what God says all begins with our RELATIONSHIP with Him! He not only created Adam and Eve, but He was in a covenant relationship with them; therefore, what God said could be trusted and believed completely because of Who God is! He is near, present, accessible and available to us. Satan wants us to feel abandoned by God and left to figure things out for ourselves. If he can get us to question Who God is, then He can get us to question what God said. Satan is always trying to draw a caricature of God, an outline of who He really is. Jesus Christ is the full and complete picture of Who God is. If you want to know God, get to know Jesus! As you get to know Him as the God Who longs for you to know Him in your relationship, you will better be able to hear Him. You will also be better able to trust that what He says IS GOOD because He IS GOOD! It may not always look good to our natural minds, but He is good; therefore, what He does and says is good. “We are not just HERE; we are HIS!” (Mo Isom). Everything He says to us is within the context of a relationship with us! We can trust our Creator and our Lord!